Editor(s): Kudryavtsev, D. O.; Balega, Yu. Yu. ; Romanyuk, I. I. Magnetic fields play a key role in the complex process of star formation and evolution. They cause flares, outbursts, and other instabilities in many types of stars. Recent results in the studies of magnetic fields of chemically peculiar and related stars were discussed at the conference. These stars show very strong large-scale magnetic fields, though they generally do not differ from normal stars in other physical characteristics. To determine how strong magnetic fields form, a well-defined sample of stars was observed and the results compared with theoretical predictions. 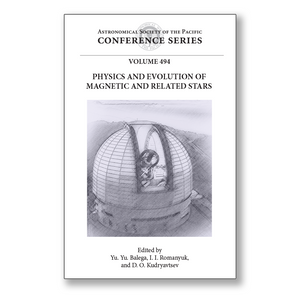 The findings of the recently-completed long-term MiMeS survey of magnetic fields in O and B-type stars are presented in this volume. A fundamental result has been obtained: 7% of those stars have magnetic fields. Fresh data on the magnetic fields of open cluster members is also presented in this book. For example, the unique magnetic star HD34736 was discovered in the Orion OB1 stellar association. Up-to-date information on the physical parameters and magnetic properties of stars at different stages of evolution is given herein. We also present new details about proposed programs and instruments in this volume. A new observational and data reduction technique will allow astronomers to achieve a measurement accuracy of 1 Gauss for stars of any type in the very near future. New high-accuracy magnetic field measurements will allow us to determine what makes stars with strong magnetic fields unique.